The Dynamics Lunch seminar meets regularly on Tuesdays at 12:00 at the lobby of the Manchester building. Speakers talk not about their own work, but rather about some interesting paper they read (can be classical or new), that they think might be interesting to a broad dynamical audience (many times it is attended also by people from combinatorics/analysis/group theory). Meanwhile all attendants eat fruit and sandwiches. Dynamics lunch: Lauritz Streck "A rigidity sequence construction on the circle"
Following "Dynamics of some piecewise smooth Fermi-Ulam Models” by De Simoi and Dolgopyat. Dynamics Lunch: Nachi Avraham Re'em: "Sethuraman-Varadhan's Proof of the Central Limit Theorem for Non-Homogeneous Markov Chains"
Dynamics Lunch: Omer Ben-Neria "Dichotomies for Borel equivalence relations"
Abstract: We would like present several results in descriptive set theory involving definable equivalence relations on Polish spaces. Given an equivalence relation E on a polish space X, we would like to study the classification problem of determining whether two objects x,y in X are E-related. Dynamics Lunch: Manuel Luethi "Well approximable numbers and times n invariant probability measures on the torus after Einsiedler, Fishman and Shapira." Dynamics Lunch: Jakub Konieczny "Sarnak conjecture and automatic sequences (following C. Müllner and M. Lemańczyk)"
Dynamics Lunch: Tom Gilat "A proof of the Erdos-Kac theorem by A. Granville and K. Soundararjan"
Dynamics Lunch: Weikun He "Counterexamples to a conjecture of Woods, after Regev, Shapira and Weiss." 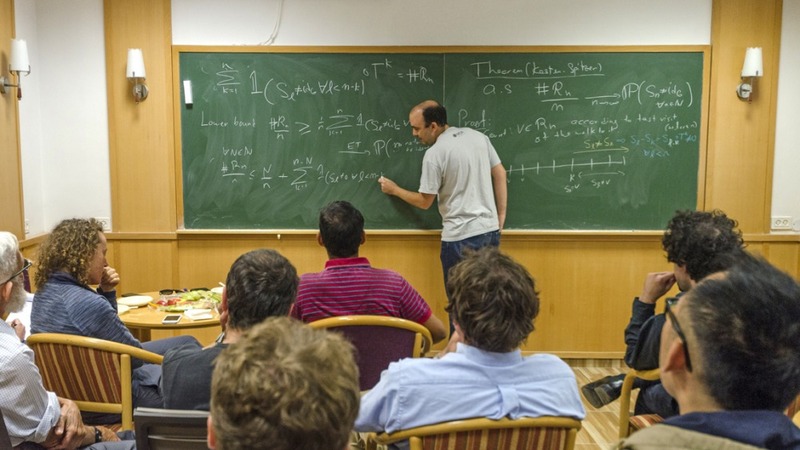 Dynamics Lunch: Tsviqa Lakrec "Recurrence properties of random walks on ﬁnite volume homogeneous manifold"